On May 22, 2018, the George Washington University’s Central Asia Program hosted a discussion of the outcomes of Uzbek President Shavkat Mirziyoyev’s recent visit to the United States and Uzbekistan’s future role in the administration’s Central Asia and South Asia strategy. The event featured the following speakers: Scotty Reid, Office Director for Central Asia, the Bureau of South and Central Asian Affairs, U.S. Department of State; Paul Stronski, Carnegie Endowment for International Peace; Navbahor Imamova, Voice of America—Uzbek service; and Marlene Laruelle, George Washington University. 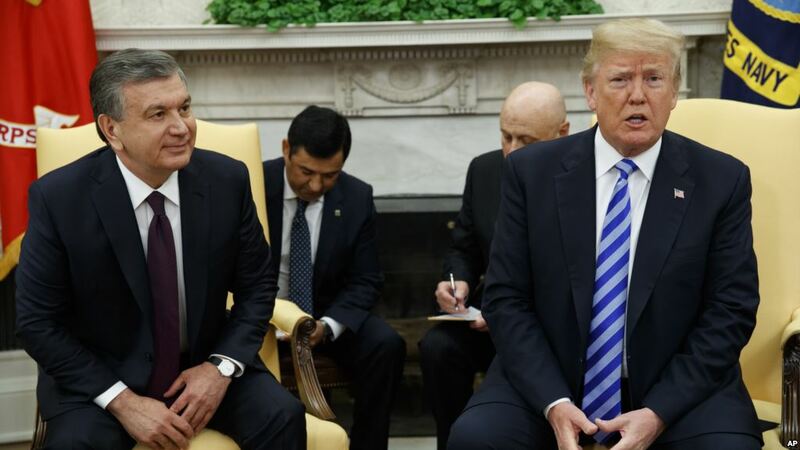 The discussion aimed to summarize and analyze the results of an eventful few days (May 15-17), during which the President of Uzbekistan made his first official visit to the United States, met with President Trump, and signed several important bilateral agreements marking a “new era of strategic partnership” between the two countries. As with the visit of Kazakh President Nursultan Nazarbayev earlier this year, the US has renewed its commitments to Central Asia and confirmed its broad engagement in the region. For Uzbekistan, meanwhile, the visit served as an important recognition of its new course of reforms. Scotty Reid called it “a dynamic visit.” He indicated that Central Asia—as a region and as part of Eurasia more broadly—continues to have a prominent position on the U.S. administration’s foreign policy agenda. It was also, he said, a historic visit, given the current potential and will on both sides to foster dramatically better relations between Uzbekistan and the US than have prevailed in the past. Furthermore, the visits of the Kazakh and Uzbek presidents this year have laid the groundwork for broader U.S. strategic relations across the region covering the length and the breadth of governance, security, and economics and trade. Mr. Reid called the region, with its youth explosion and economic potential, “vital, strategic, and pivotal.” He indicated that Central Asia might serve as a model and underscored that the local population should not be forced to make zero-sum choices. Reid expanded on this topic by describing notable events that State Department officials had held in Dushanbe and Bishkek earlier this month that highlighted a genuine desire among the region’s governments and peoples to access information and engage in a variety of US projects in Central Asia. These meetings and events underscore the need for the U.S. to engage with society at different levels: on the streets, in schools, and through civil society. During President Mirziyoyev’s visit, the two countries signed a Memorandum of Understanding in the areas of education and cultural exchange that will bring about more cooperation between universities, facilitate agricultural knowledge transfer, and support Uzbek exports and the Uzbek economy. The other important issue addressed during the visit, which was discussed with the USTR (United States Trade Representative) and the Treasury Department, was the first stage of negotiations that could possibly accelerate Uzbekistan’s accession to the World Trade Organization. As a follow up to the visit, a number of business-to-business events are planned for later this year in Tashkent, including the Trade Investment Forum and the Central Asia Trade Forum. Reid also touched upon the issues surrounding Afghanistan, which thanks to the efforts of President Mirziyoyev’s administration, has started to be reintegrated into Central Asia and regaining its “regional identity.” Mr. Reid noted that President Ghani has said as much, noting that he sees “new light” in Central Asia as he has been politically embraced in the region, and personally welcomed in Tashkent last month for the Tashkent Conference on Afghanistan. The US, Reid said, continues to encourage the development of Uzbekistan’s relationship with Afghanistan and praises President Mirziyoyev’s diplomatic initiatives and firm committment to regional affairs. The US and Uzbekistan have developed a clear schedule of next steps and follow-up meetings to support progress, and Mr. Reid noted the impressive spirit of partnership between the two countries. Paul Stronski admitted that when he served on the White House’s National Security Council between 2012 and 2014, he never expected that there would be such rapid activity in U.S.-Central Asia relations as we have witnessed over the past year with the visits of both the Kazakh and Uzbek presidents to the White House. The Trump administration has increased its attention to Central Asia and seems to consider Central Asia at least as an entity of itself, and not just through the prism of China or Russia. Dr. Stronski describes President Mirziyoyev’s visit as extremely noteworthy, particularly the Uzbek president’s openness to regional cooperation and efforts to pull Afghanistan into regional security discussions. Uzbekistan’s new approach to regional security under Mirziyoyev has happened so quickly. The slight liberalization that has occurred in Uzbekistan makes it possible for the U.S. to re-engage. Much of US efforts thus far have focused on improving human security. The emphasis now is on social and economic issues, but it eventually should expand to include more progress on broader human rights. Uzbekistan has already had some success reforming the judicial and security sector and embarking on the fight with corruption, all measures that will improve the investor climate with the hope of increasing foreign direct investment and and trade. Indeed, Uzbekistan’s actions may enhance the attractiveness of the entire region, Stronski stressed, however, that the Uzbek government must be held to its promises of improvements in the areas of justice and investment climate. Stronski echoed Reid’s view that Uzbekistan has helped reintegrate Afghanistan into the region through trade, energy, and infrastructure linkages, all of which will contribute to regional stability. Mirziyoyev’s desire for regional cooperation marks a critical turning point for a previously fragmented and troubled region, he said, recalling that the failure of regional cooperation in the past was attributable not only to President Karimov’s isolationism and his difficult relations with other Central Asian leaders, but also to Turkmenistan’s official neutrality and the nature of that regime. Kazakh President Nazarbayev’s efforts to position himself as a global leader focused the country away from Central Asian issues. Moreover, many notable regional initiatives— including the Belt and Road Initiative and the Northern Distribution Network, and others—have historically aimed at shipping things through Central Asia, not at building connectivity in Central Asia. While cross-border trade has been facilitated by the elimination of tariffs and the reduction of prices within the region, this cross-border trade has not been yet institutionalized. Neither has regional cooperation as a whole. Much of the recent success has been made possible by Mirziyoyev’s new approach to his neighbors. The region needs to move beyond personalized diplomatic relations to more institutional-based ones where presidential-level intervention is not needed for what should be regularized cross-border cooperation. Luckily, Stronski notes, Uzbekistan and Kazakhstan have a growing class of technocrats in their respective civil services who understand this need and should work to facilitate this transition from personalized-to-institutionalized relations. Navbahor Imamova is a prominent Uzbek journalist at the Voice of America and a leading Washington-based authority on geopolitics and national development in Central Asia. Navbahor Imamova recalled President Mirziyoyev’s visit to New York for the UN General Assembly last year and how it was accompanied by high expectations of change in the country—that it might well be the historic moment when the press became free and ties among the Uzbek diaspora could be made. Now, after all the reforms of the past year, the question is: how sustainable is this change? Imamova stressed that the Uzbek authorities should be held responsible for the trajectory of reforms. Uzbeks have heard grand rhetoric about the irreversibility of reform and the way in which the country is responding to a popular desire for change, she said, but they need to be kept apprised of the changes that are actually happening in the country. Ms. Imamova has recently been accredited as a Voice of America correspondent in Uzbekistan, a position that allows her to dive into the reality on the ground. Fundamental economic, security, education, and health reforms all need to be reported on professionally, she says. According to Imamova, a need for a new parliament is essential, as some leading members of the Oliy Majlis recognize. New elections should be called and empowered lawmakers whose values are in line with the new political climate should be chosen. In addition, the human rights situation must be improved. A remarkable increase in open discussion on these issues has been observed, and this is the first step toward reform. Uzbekistan’s new aim—to become a modern democratic state that respects international standards—requires new responsibility, a responsibility, Imamova indicated, that journalists share. The development of a free press poses numerous challenges, chief among them dramatically increasing news coverage from within the country. Marlene Laruelle noted that President Mirziyoyev and his team have a genuine vision of the reforms they want to implement and should be commended for this. Uzbekistan demonstrates that, remarkably, autocracy can be reformed from within. The Uzbek “revolution from above and from inside” may have some parallels with perestroika-era reforms, a transformation initiated by Soviet elites, but Uzbekistan’s opening will hopefully have a better outcome. Dr. Laruelle noted that many areas of Uzbekistan’s ongoing transformation must be monitored, including the dynamics of Uzbekistan-Kazakhstan relations, which must progress from being tense and competitive to being cooperative and open to exchanging models and ideas. What might Uzbekistan see in Kazakhstan’s development path? What will it emulate and what not? Will it implement reforms in a uniquely “Uzbek way”? Among other issues, Uzbekistan must rethink its historical mismanagement of water (misuse and overuse). Relations with Russia are also important, from interactions with the EEU to migration issues. Will the Uzbek government, which has traditionally denied migration, now address and diversify it? Can migrants and members of the Uzbek diaspora be integrated into contemporary Uzbek society? Youth and human capital are as important as ever, hence Mirziyoyev’s focus on education reforms. Associate Director and Research Professor at the Institute for European, Russian and Eurasian Studies (IERES), Elliott School of International Affairs, The George Washington University. What might Uzbekistan see in Kazakhstan’s development path? What will it emulate and what not? Will it implement reforms in a uniquely “Uzbek way”? Finally, Uzbekistan must decide which path to take in terms of relations with Islam. President Mirziyoyev has already taken impressive steps to make Islam better integrated into education and the national ideology, but the relationship will remain a critical one for the country’s future.